You may want to know that you can claim a replacement lower right side panel which includes the oil sight window under warranty from your dealer ... if you have suffered burn damage from your exhaust system. Ducati has already issued a warranty recall to add a gromit to space the lower right bottom half fairing away from the exhaust. However, you may want to check if your exhaust melted the fairing prior to the application of the gromit and if so get it replaced under warranty and gain the ability to easily see your oil window. 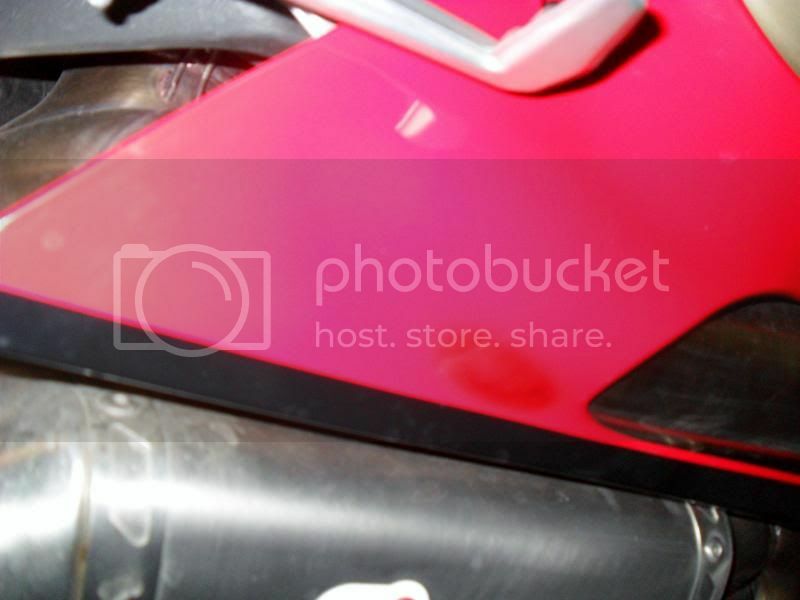 I have attached some photos of the new replacement lower right hand side panel for a 1199 Panigale S Tricolore. I just called Ducati Indianapolis and they said they rejected my claim and appeal to get my fairing replaced. This is because I installed the full exhaust myself. I installed it last year and it came with the small grommet. I made this a sticky in the M$T section...Thanks Cali!! I installed my system myself, and they replaced it no questions asked. This time I put on the exhuast reflective heat tape.. If they ever did say they would not cover it, I would dremel a opening where the burn is. When mine burned it looked like the exhuast was sticking to the plastic. The heat shield tape should correct that. I just got my second replacement yesterday after having waited over a month for my local dealer trying to deny my claim due to having akrapovic fitted on my bike and also cuz I installed it myself. I looked at those morons like they were stupid and said this is a KNOWN ISSUE. I've replaced this before back in August when I had my stock exhaust. Fitting an aftermarket exhaust has nothing to do with it regardless who installed it. Since it is nothing but a cosmetic problem, obviously I wasn't in a hurry to get it replaced but this time I had them slap on some of the reflective heat tape to help with the issue. I didn't go to "my dealer" cuz it's about 25 miles away and I figured I'd try my local dealer which is like 5 miles. The fact that things vary sooooo much from dealer to dealer is disturbing. You'd think it's comin out of their own pockets when it's a warranty issue. They even tried to have me make an appointment to replace the part. Of course I fought that until they let me bring in the fairing n just do an exchange. I looked at the warranty invoice and they put on there 1 hour labor $120 for something that took me 5 minutes to take off. Some dealers will find any excuse to take their sweet time. That's why when you find a dealer that really takes care of their people, it is worth the extra effort on your end. heat reflect tape made mine last a good while before discoloration finally took over from stock exhaust cooking it. A new one is on its way towards tail end of warranty. I did the same thing, yet chip in Detroit told me they would warranty it. What does the grommet look like? lol Call another dealer. Over 30,000 spent at a store and they treat you like that, and I know why. It's hard to sell just ducati. Ducati is wanting dealerships to sell ducati only leading to many ducati dealers not selling ducati anymore. Detroit Ducati store has a 15,000 thousand dollar rent a month I was told by a local dealer that went under. They will do anything to survive. my 1199 is just 3 months out of warranty and I am not even the original owner. I started the process for a courtesy replacement directly from Ducati via my Ducati dealer and am hoping it works out.